To Cite: Siroos B, Sharify Bahram Z, Ghaemi O, Zia Ziabari S M, Hedayat Yaghoobi M. A Case of Progressive Rhino-Orbital Mucormycosis Involving the Brain Via Direct Extension, Retrograde Perineural Spreading and Middle Cerebral Artery Vasculopathy, Arch Clin Infect Dis. 2014 ; 9(3):e17580. doi: 10.5812/archcid.17580. 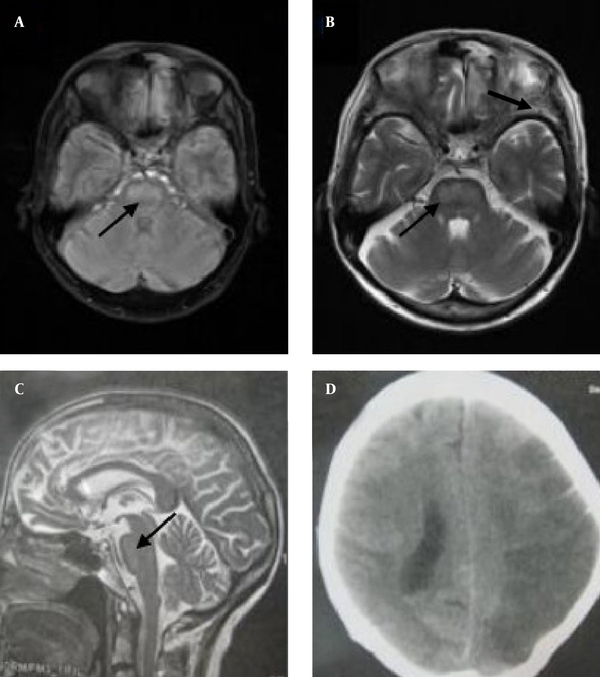 Introduction: Rhino-orbito-cerebral mucormycosis is a progressive angioinvasive fungal disorder which almost always complicates immunocompromised patients. Case presentation: We described a case of fulminant rhino-orbito-cerebral mucormycosis in a 65-year-old woman, who presented with progressive neurological deficits due to involvement of orbital apex and the central nervous system by local invasion of the left inferior frontal lobe, retrograde perineural spreading to the brain stem and middle cerebral arteries thrombosis. Discussion: Early diagnosis is mandatory in managing of this life-threatening disorder. Urgent surgical debridement associated with antifungal agents (amphotericin with posaconazole) is the mainstay of treatment. Mucormycosis is a progressive angioinvasive fungal disorder, which almost always complicates immunocompromised patients, predominantly in a setting of phagocytosis impairment such as neutropenia and poor controlled diabetes mellitus (DM). Rhino-orbito-cerebral mucormycosis is a known complication of DM (1). It usually begins as progressive sinusitis followed by central nervous system (CNS) involvement via several routes including local extension, invasion to large arteries especially carotid vessels and middle cerebral arteries (MCA), and rarely retrograde perineural spreading (1). Here we introduced a case of fulminant rhino-orbito-cerebral mucormycosis in a 65 year-old woman, a known case of poor controlled diabetes mellitus who presented progressive neurological deficits due to involvement of CNS by local invasion of the left inferior frontal lobe, retrograde perineural spreading to brain stem and MCA thrombosis. The patient was a 65-year-old female, a known case of DM and hypertension who presented progressive left eye ophthalmoplegia and quadriparesis. The patient was in good health until twenty days before admission when she developed frontal headache and diplopia. She was admitted to a local hospital and with the impression of DM-related incomplete ischemic third nerve palsy (left medial rectus paresis), she was treated with aspirin and lovastatin. The patient’s complaints had a progressive course and eventuated to left ophthalmoplegia and blindness during two weeks, followed by quadriparesis. She was referred to our hospital and on admission the patient was ill but not toxic. She had no history of fever, chills or weight loss. However, her glycemic control was poor because she skipped suitable diabetic regimen and didn't use her drugs on a regular basis. Physical examination revealed a tender area on the left frontal region. The left eye was fixed and blind with no light perception. Smell sense was impaired as well. Mild facial hypoesthesia on V1 distribution of left trigeminal nerve was detected. These findings were in favor of orbital apex syndrome. Other cranial nerves were normal. Motor examination realized mild quadriparesis (muscle force of 4/5) with preferential involvement of the right side. Deep tendon reflexes were exaggerated and plantar reflex was upward on the right side and mute on the left side. Light perception and proprioceptive sense of limbs were normal. Based on typical history and underlying disease, conventional amphotericin B-deoxycholate was started immediately and a complete diagnostic work up for excluding rhinocerebral mucormycosis was done. 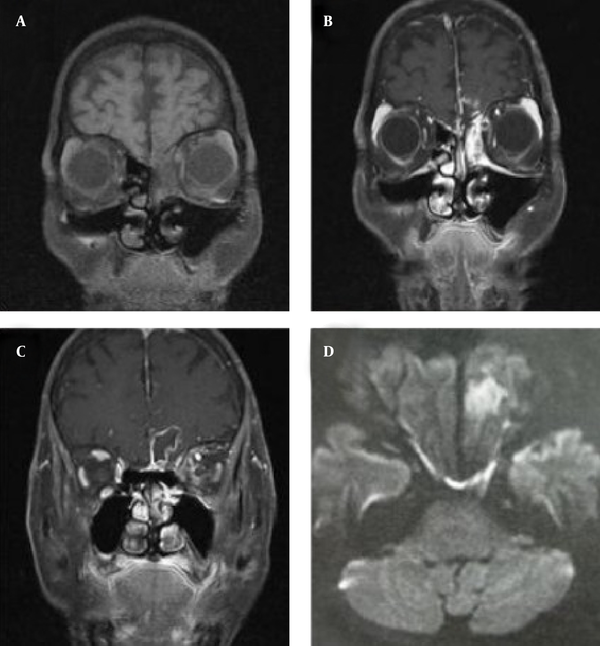 On day 0, time of the first visit to our hospital, brain magnetic resonance imaging (MRI) disclosed an abnormal (iso-intense on T1WI and hypersignal on T2WI and FLAIR) gadolinium enhancing lesion in the left ethmoid sinus (Figure 1 A and B) with invasion to the left inferior frontal lobe which showed restriction diffusion characteristic for brain abscess (Figure 1, C and D). However, the above findings didn’t explain the patient’s quadriparesis. Fine cuts of brain stem (day 0) realized abnormal hypersignal lesions on FLAIR and T2WI in the central region of the brain stem (Figure 2, A- C). In regards to underlying diseases (DM) all were suggestive of progressive fungal infection especially rhino-orbito-cerebral mucormycosis. Urgent endoscopic biopsy revealed inflammatory pink mucosa without any pathological evidence of mucormycosis. Nonetheless, amphotericin was continued and comprehensive work for excluding inflammatory granulomatosis disorders such as Wagner vasculitis and metastatic carcinoma was carried out. All results were negative. Unfortunately, despite standard antifungal regimen, the patient developed sudden onset loss of consciousness and right hemiplegia. Brain computed tomography imaging on day six showed an extensive hypodensity on the left hemisphere compatible with left middle cerebral artery territory (Figure 2D). Color Doppler sonography disclosed normal flow in the cervical portion of carotid arteries. All findings were suggestive for extension of a fungal infection to the intracranial portion of the internal carotid artery and middle cerebral artery (MCA). After several days, she developed MCA syndrome with a progressive fulminant course and unfortunately this led to the patient’s death. Autopsy was performed. The histopathological assay disclosed many aseptate right angle branching hyphae in a necroinflammatory background suggestive for zygomycetes infection (most probably mucormycosis) that was confirmed by a fungal culture (Figure 3). A and B) Invasion of the left frontal lobe as a ring enhancing lesion, C) showed restriction diffusion, D) characteristic for brain abscess. Axial FLAIR image (A) and axial and sagittal T2WI (B and C) showed weak signal intensity in the ventral portion of the brain stem which explained our patient’s quadriparesis; axial CT imaging suggested hypodensity in the left hemisphere, compatible with middle cerebral arteries territory (D). Mucormycosis is a relatively unusual opportunistic infection, which presents an aggressive disorder with high rate of mortality (more than 60% in untreated conditions) and significant morbidity (2). Mucorales especially Rhizopusarrhizus, a subclass of zygomycetes species, are the principle etiological agents of this life-threatening infection (1). A growing body of evidence has indicated that phagocytes mononuclear and polymorphonuclear play a cardinal role in killing mucorales via production of oxidative metabolites and the cationic peptides defensins (1). Therefore, hyperglycemia, acidosis, neutropenia, hematologic disorders and steroid use which have been shown to impair these defensive mechanisms, predispose patients to mucormycosis infection (preferentially the rhinocerebral form) and exacerbate its dissemination (1). This hypothesis is supported by the fact that mucormycosis is not a common opportunistic infection in human immunodeﬁciency virus (HIV) infected patients, who have relatively preserved neutrophil count and function (3). Several clinical syndromes including pulmonary, cutaneous, gastrointestinal, rhinocerebral and disseminated mucormycosis have been described (1). Rhino-orbito-cerebral mucormycosis accounts for about 30-50% of all cases and appears to be the most common form of disease and develops in a setting of diabetic ketoacidosis in more than 60% of patients (1). 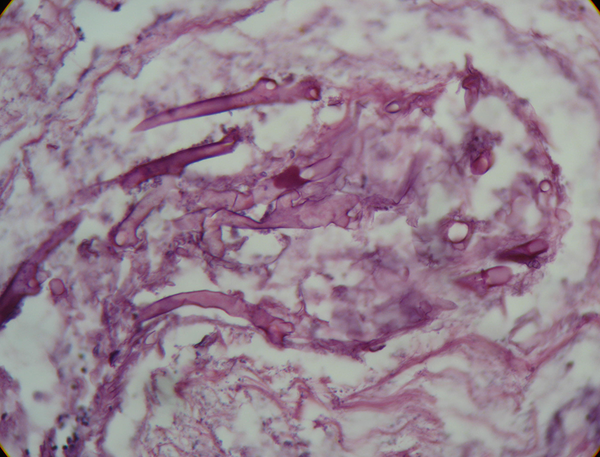 Inhaled fungal elements in a susceptible patient sequester in paranasal sinuses, usually ethmoid, leading to invasion to sinuses, orbit and the brain. Fever, headaches and ophthalmoplegia are the main clinical manifestations which are followed by blindness, frozen eyes, cavernous sinus thrombosis, large arteries vasculopathy and stroke (4). Early diagnosis is mandatory for managing of this life-threatening disorder (5). In a retrospective study, based on analyzing clinical course and outcome of 30 cases of mucormycosis in educational hospitals of Tehran, Barati et al. showed that there is a strong correlation between delay in diagnosis and mortality. They reported that timely amphotricin administration and surgical intervention were successful in preventing disease progression to critical structures and reducing mortality rate (6). Of note, according to reported autopsies, definite diagnosis in more than half of the patients was confirmed by a postmortem pathological assay (1). Thus it appears that despite a negative primary biopsy, if there is a strong clinical suggestion, the treatment should be continued until confirmation of a reasonable alternative diagnosis. Headaches, ophthalmoplegia and blurred vision could be a warning sign of progressive rhinocerebral mucormycosis; thus in very diabetic patients with the above findings, urgent evaluation with brain and paranasal sinus imaging, preferentially MRI and diagnostic nasal endoscopic approach should be considered (4). Once the disease is clinically suspected, antifungal treatment with polyene agents, amphotericin B deoxycholate and its lipid derivatives, should be started as soon as possible (1, 2). At the beginning of the disease, mucosal tissues may appear pink and mistakenly be evaluated as normal. Thus, if clinical suspicion index is high, blind mucosal biopsies must be taken (1). Modifying of predisposing factors including hyperglycemia, ketoacidosis, anemia, and discontinuation of deferoxamine and steroids is mandatory in management and are strongly recommended (4). Even, if the fungal agent is susceptible to antifungal drugs in vitro, urgent surgical debridement is necessary for reducing the chance of angioinvasion and CNS complication (4). Necrosis and thrombosis reduce drug penetration ton the site of infection (1). Some azole derivatives such as posaconazole and ravuconazole have promising in vitro inhibitory effects on mucorales growth, which has been supported by several in vivo reports (4, 7). Nonetheless, these agents should only be used for adjunctive therapy in combination with amphotericin (1, 4). In contrast todeferoxamine which is a precipitating factor for mucormycosis, new iron chelating agents such as deferasirox have been elucidated that not only do not exacerbate Rhizopus infection, but also have in vitro fungicidal activity and improve survival of patients with mucormycosis especially when used in combination with amphotericin (4). Recently, hyperbaric oxygen and granulocyte-macrophage colony-stimulating factor have been shown to exhibit beneficial therapeutic effects in adjunct with standard treatment (antifungal amphotericin plus surgical debridement) (1, 4). Mucormycosis is a rare infectious disease with irrecoverable neurological complications. Unfortunately, despite its characteristic course, this life-threatening disorder is usually associated with high mortality and morbidity mainly because of delay in diagnosis in primary care centers. Hence, high index of clinical suspicion is necessary for preventing devastating sequels. Urgent surgical debridement associated with antifungal agents (amphotericin with posaconazole) is the mainstay of treatment. We sincerely thank our coworkers who were involved in managing this patient but didn’t have the criteria of authorships.